Mobile action games always have a way of presenting new and exciting ways to dispatch our enemies. Whether by way of a well-placed spell, a powerful sword slash, or through stealthy and precise attacks, there are always different ways to destroy your opponents. This variety is important since, in games of this genre, you will find yourself running back and forth through battlefields in search of enemies with which to hone your skills. Furthermore, you may also run through the same dungeons over and over to gather materials and other useful objects, which can become stale without combat variety. 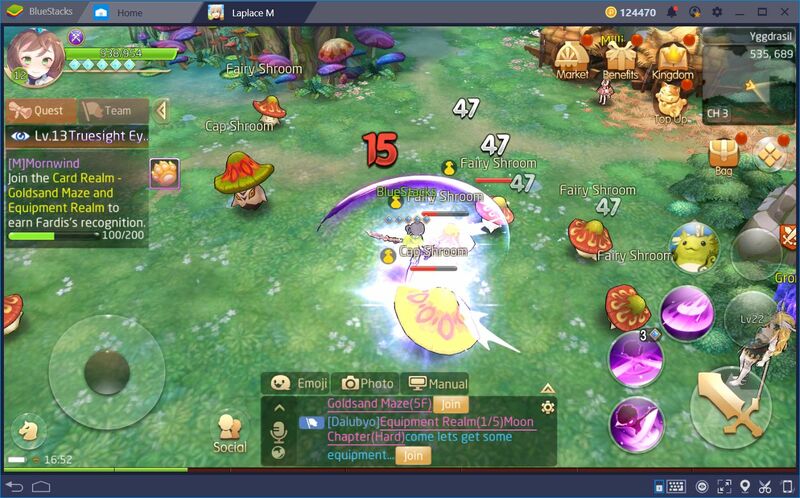 The combat system in Laplace M, in contrast with other action games, is very dynamic and lets the player string attacks, use skills, and evade enemy attacks with great liberty. This is a game that requires both great dexterity to stay alive in the field, as well as vast knowledge about the skills and playstyles of every class to dispatch enemies with ease. If you want to learn more about the mechanics in the game, feel free to read our Laplace M review, where you will read about how this game sets itself apart from the rest, at least when it comes to its combat. 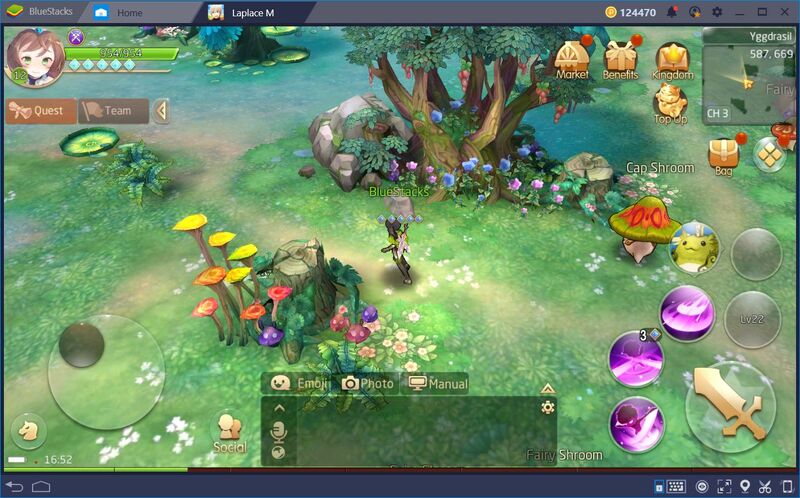 However, regardless of the class that you choose at the start, or your preferred play style, you will enjoy many benefits from playing Laplace M on BlueStacks. 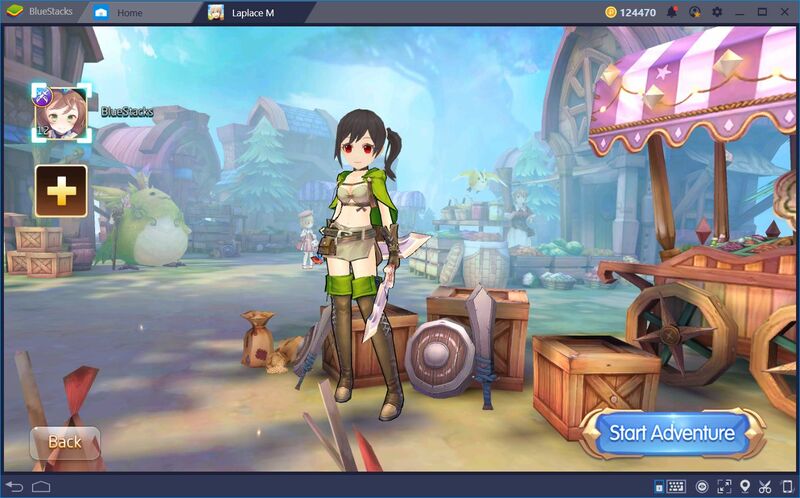 Our Android gaming platform brings you plenty of tools that you can use on many occasions to outsmart and surpass your rivals. In this article, we will explain how you can use these tools to optimize your performance in this game, starting with the most important aspect: the controls. One of the most important parts of any action game is being able to move gracefully across the battlefield, free from any obstacles or restrictions. However, when you play on your phone, you’ll probably feel that the controls are working against you and that you can’t attack nor move freely. This happens because the touchscreen controls are not designed for these types of games with real-time combat, and you will probably struggle to get used to the movement and combat because of this. 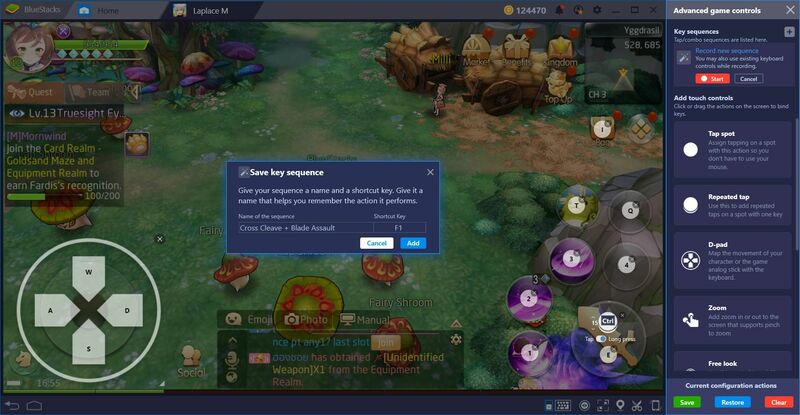 Luckily, when playing on BlueStacks, you will have access to the keymapping tool, a function that allows you to create and configure personalized control schemes for any title. 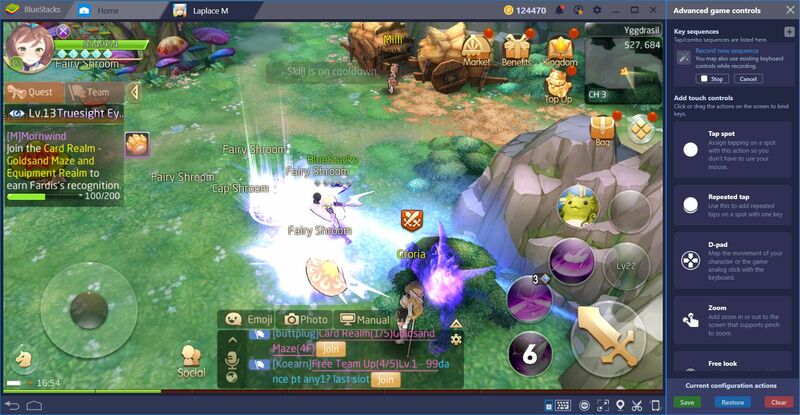 In this sense, you will enjoy greater control in any game by using your mouse and keyboard, and will also stop struggling with your phone every time you’re in combat. In Laplace M, particularly, it’s very important to create serviceable control schemes that will allow you to adequately control your character at all times. This is mostly because the combat in this game is very fluid and dynamic, and rewards the player for their skill and dexterity. In this sense, if you create optimized control schemes, your performance when attacking, defending, dodging, and using skills will increase considerably. In other words, you will always be able to execute the appropriate moves, at the appropriate moments. Before we move onto the next section, we want to talk about one of the newest additions to the keymapping tool, which can come in handy for this game. The quick tap tool is a new component of the keymapping tool and allows you to place a shortcut on the screen which, when you press the corresponding key, will perform either a long touch or multiple taps in the designated spot. This action is important in Laplace M since, in this game, you may attack while moving. In this sense, by using the quick tap tool in “long touch” mode, you may stay on the offensive while dodging enemy attacks, without the need for mashing the attack button at all times. Notice how, in the picture above, we assigned two different shortcuts to the attack button. If you press “E”, your character will execute a single attack. However, by pressing “Ctrl”, you can automatically unleash a barrage of attacks, which is ideal for staying on the move while attacking. With the keymapping tool, you can focus more on fighting against the enemy, and less on fighting against the controls. 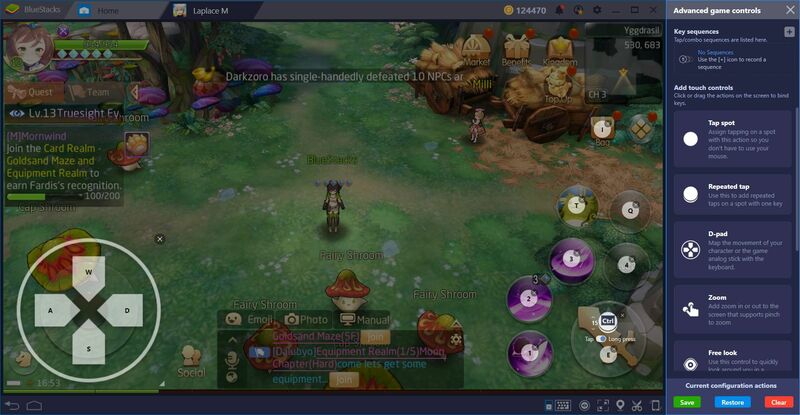 Another handy BlueStacks tool for this game is the combo key, which you can use for recording strings of commands and replaying them later with the press of a key. For a game like Laplace M, the combo key, as its name implies, can be used for recording skill combos, and to reproduce them with precision in other occasions. In this sense, you can use several skills and spells back-to-back by pressing a single button, and without the risk of messing up in the heat of battle. Nevertheless, before you can use this tool appropriately, you must first create several combos for your character. Before we proceed with the explanation, we suggest taking a look at our combo key guide where you may learn about the basic usage of this tool. Feel free to skip it if you’re already familiar with this tool, however. With the recorder running, let’s use several skills in a row. For this scenario, we will use the Cross Cleave skill, which allows us to close the gap between our enemies and ourselves. Afterward, we will use Blade Assault, which deals heavy damage to all nearby enemies. Immediately after you launch your last skill, stop the recording and give your combo a name and a key shortcut. We recommend using a name for the combination of skills used in the combo to avoid confusing them with other combos. In this game, there are some skills that chain naturally with others. The Cross Cleave + Blade Assault combo that we mentioned above is just one of these awesome combinations. As you keep leveling up and unlocking different features, you will discover new techniques and attacks that can be optimized through the combo key. 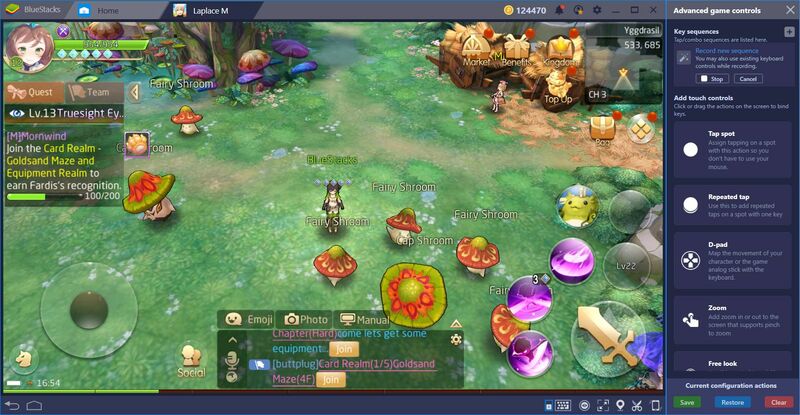 By playing on BlueStacks, you will obtain these and many other benefits over those who play on their phones. To this end, all you need to do is download and install BlueStacks to enjoy all the benefits mentioned above for all your favorite games.